SOS Triathlon. A Guest Post by Friend Of The Team Marky B. 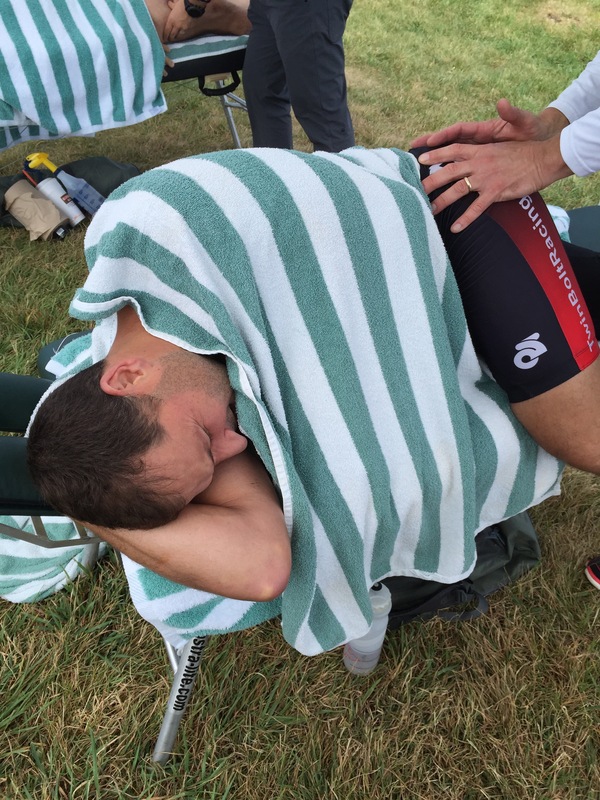 Friend Of The Team Marky B. recently completed this insane sufferfest of a race, and I am proud to share his race report. This race is completely loco, which is perfect for Mark. 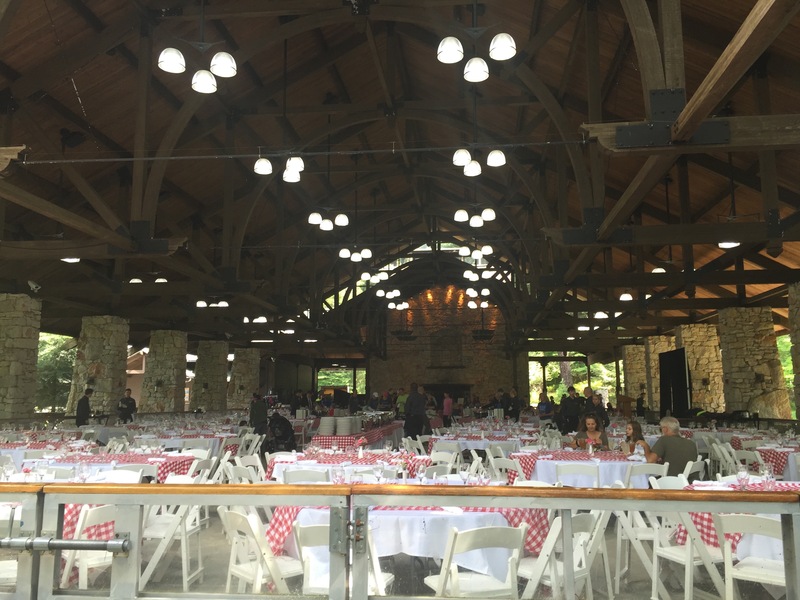 Enjoy this guest post! There are two things you need to know before you take on the SOS Triathlon. You need a Best Friend Forever. Not a fake, pretend you are besties, only show up when you crack a bottle of wine, suddenly busy when you need help BFF. You need the real deal; the one that would take you to Vegas on short notice and won’t tell anyone what happened there. Ever. That kind of BFF. You need to be a bit nuts. Not certifiable, just sort of off-kilter. Why? 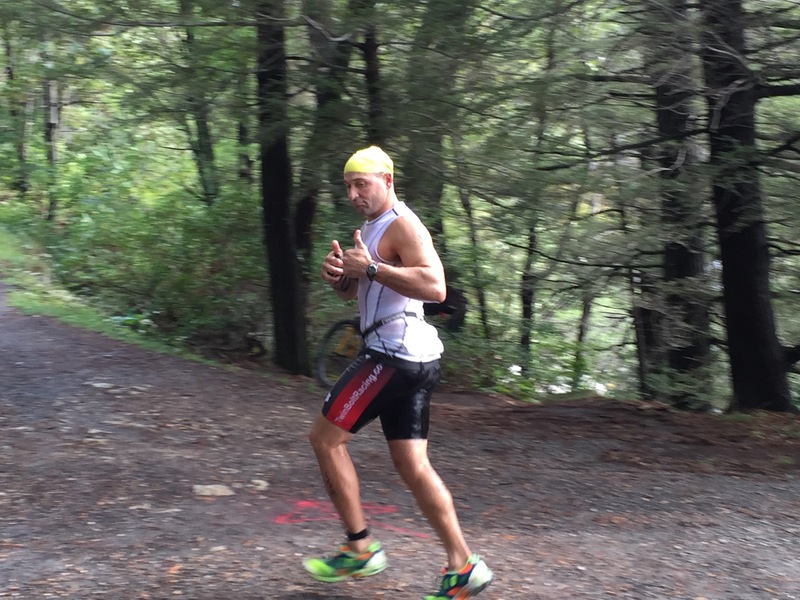 30-mile bike, 4 trail runs totaling 19 miles and 3 mountain lake swims totaling 2.1 miles. (www.sostriathlon.com) This race is nuts and you need a BFF to go with you. The perfect storm is if your BFF is also nuts. Now, you are ready to race the SOS. The SOS Triathlon has been around for 30 years and like all great races, it was started by a couple of people that thought it would be really cool to start a really cool race in a really cool place. 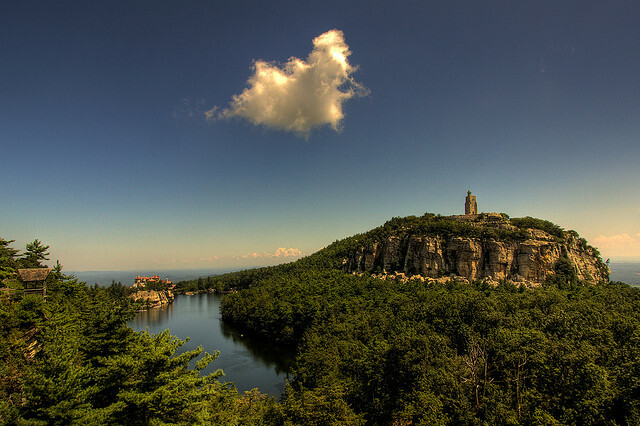 This race takes place in the Shawangunk mountain range, part of the Appalachians in NY, and is affectionately called the “Gunks.” (I had the Gunks once and it took an extended course of antibiotics to get rid of it.) The race organizers are passionate (crazy), require each racer to bring one pit crew member (your BFF! ), and then they provide 250 volunteers for a race that is limited to 150 racers. Yep, only 150 peeps. Awesome. 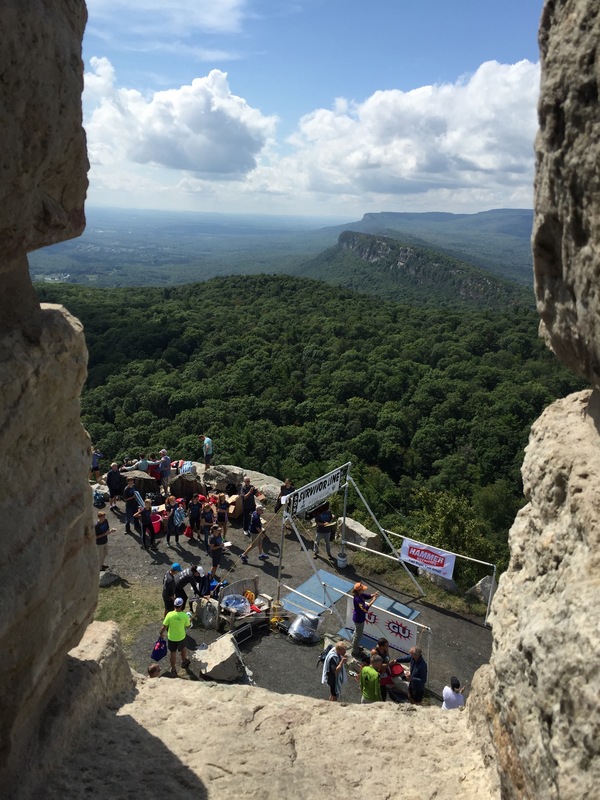 The race starts off with a bike – only 30 miles around the Gunks, with a 5-mile, 1,000-foot climb into the range itself. The climb is like the opposite of Death Valley. You then hop off your bike and this is when your BFF shows up to do what they do best – put up with your crap. In reality, your BFF had to show up with you at the crack of dawn, then watch you start the race, drive to a new location, set up your transition, take your bike from you like you are some big time baller, and then pack up all your stuff. A 30-mile bike is not so bad you say? The race is about to get real. You get off your bike, grab your running and swimming gear and you start running uphill on mountain trails. The first climb is called Cardiac Hill, and it is clear by the fact that your heart is trying to leave your chest that it is aptly named. 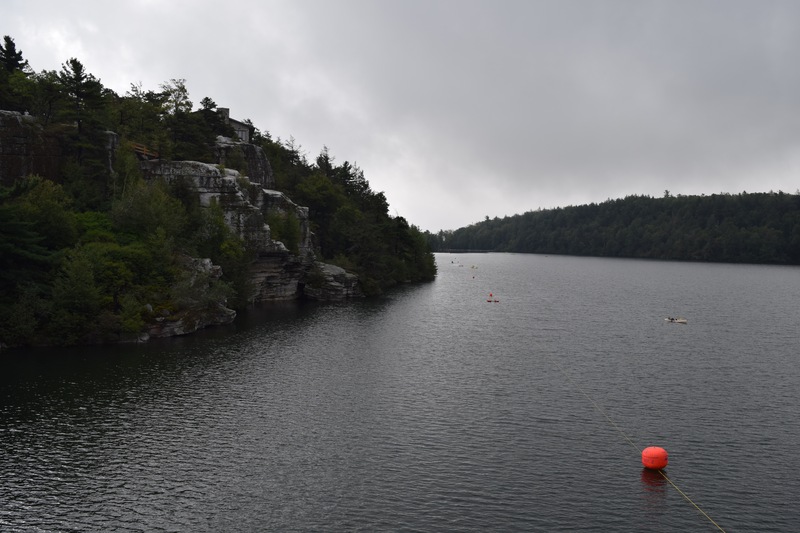 After 3 miles it kind of levels out and you descend 2 miles to the shores of Lake Awosting – the first of your 3 swims. Did I mention that you have to carry everything with you? That’s right – you run with your swim gear, and you swim with your run gear. Figure that one out…. Here is where my total inexperience showed. I’m at the first lake, attempting a complicated procedure to strap my shoes to my body, taking forever, and watching seasoned competitors pass me by shoving their shoes into their shorts. Doofus! So, into the water for a 1.1-mile point to point swim. Out of the water and into the hands of the race crew. No time for a massage, kind lady! I am off for more trailing running! 5.5 miles later, you reach the second swim. Did I mention that the scenery is stunning? I am talking Last of the Mohicans stunning. It was hard to not stop and just lie down, and enjoy the view. But I digress, once again. The second swim is awesome, because it is half the distance of the first, and your very bestest BFF is there watching you get out of the water. My race crew chief (wife Shauna / BFF) was so prepared that other crew members were jealous. Not only was she the absolute first person at the transition, she had a chair, warm coat, hat, magazines, and left overs from the awesome Turkish place we ate at the night before. You don’t mess with my BFF! However, by the time you are five miles into run 3, you no longer feel like you can conquer the world. Don’t get me wrong; the scenery was stunning high up on the ridge. I’m talking waterfalls, people! But, then you realize that the finishing tower awaits and it is currently at the same elevation as you, and that between you and the finish is a really, really big valley. Oh. My. Gravy. So, into the gorge you go and it takes 2 miles to climb out. At this point, I realized that I might be a “bit undertrained”, which feels kind of like being a “bit over served” on a Saturday night. Actually, it felt exactly like that! So I hit rock bottom (literally) and then there was a huge climb, with 5 racers walking on it. I valiantly started running until another racer came up behind me and said “Oh good, everybody’s walking!” So I joined the group and trudged a quarter mile and got going again. 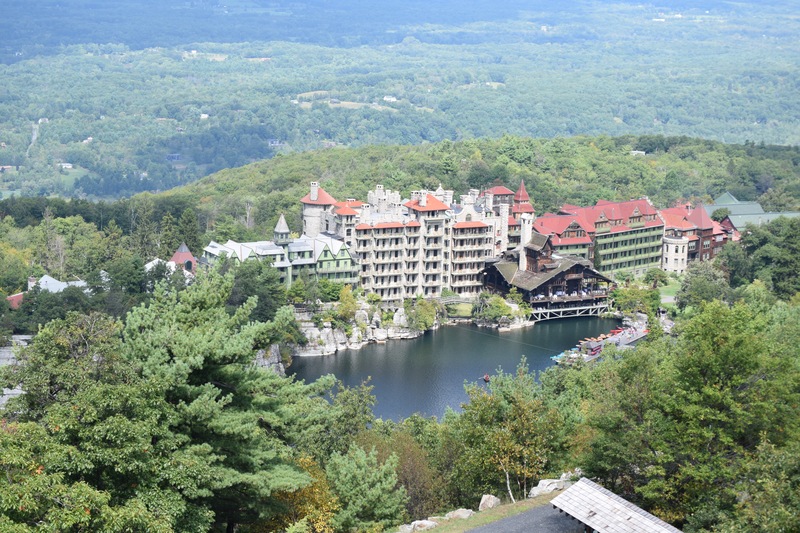 So, you hit this final lake, and about half way across you see the most beautiful resort you have every seen…Mohonk Mountain House. Despite its silly name, the resort is gorgeous, super hoity toity and waaaaayyyyyy out of my price range. So you emerge from the lake like a drowned rat, put your shoes on one last time, and then a mad dash up 1,500 feet to the overlook tower. 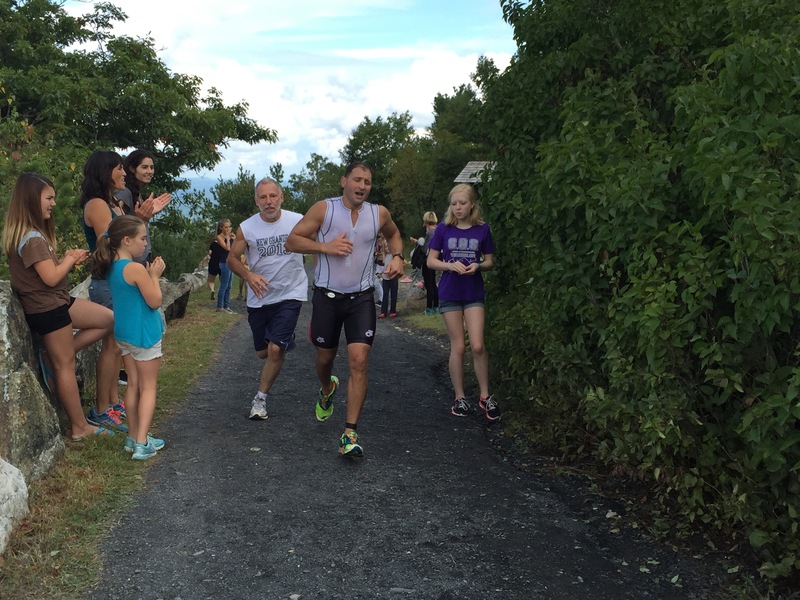 This picture of the finish line shows the ridge you came from in the background…. I thought the pain was over, until I opted for a post-race active release session with the physical therapist. The dude worked me over so hard that my BFF was laughing and taking pictures of me in pain. My face was worse than my finishing photo…. When you finally recover from this punishment, you can enjoy the amazing view. After a time, the reality of this day sets in. Thirty miles of biking, 18 plus miles of running, 2 miles plus of swimming – all through the most beautiful scenery you can imagine with some amazing people. Then you get to eat, and eat, and eat. 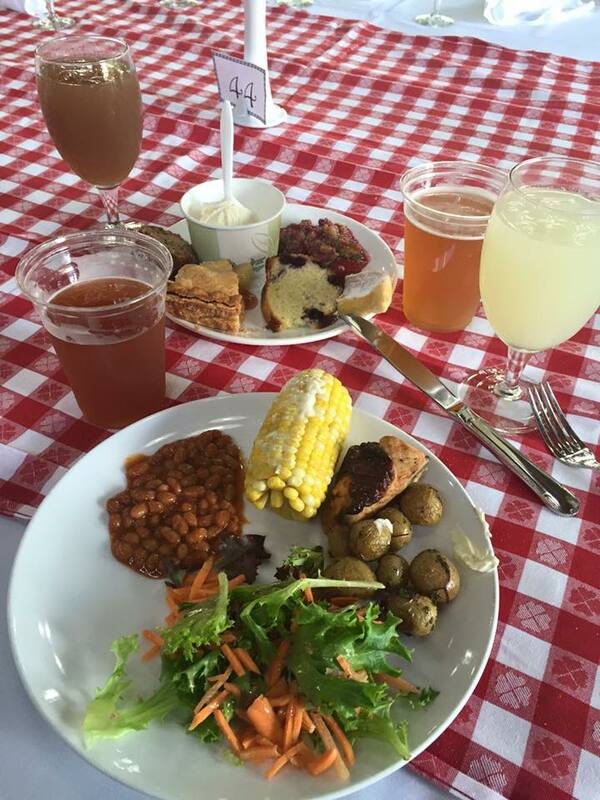 The post race meal is a sit-down affair, with all the beer you can drink, and high-end banquet food you can handle. Unreal.